I don't believe there is a built-in, system wide Keyboard Shortcut. 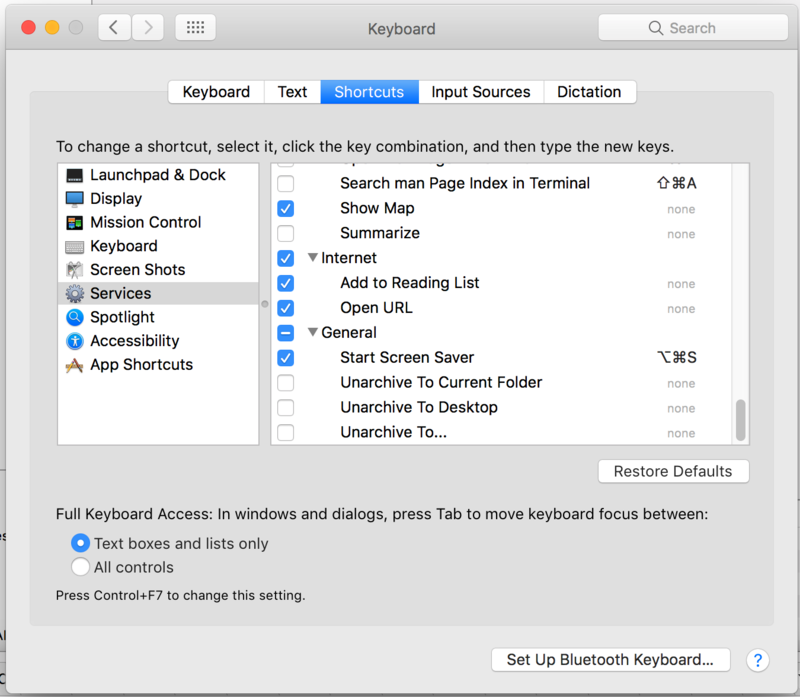 The quickest way to activating the screensaver via the keyboard is either via a "Start Screensaver" command using a launching applications such as Quicksilver, Alfred, or Launchbar. The quickest way of starting the screensaver using your mouse is via Hot Corners. Open System Preferences, click "Desktop & Screen Saver", click over to the "Screen Saver" tab and click the "Hot Corners" button in the bottom left. There you can specify a corner to roll over in order to start the screensaver. If you want to start the screensaver quickly, because you want an easy way to lock your computer, a possible answer is located in the high-view "Mac OS X Hidden Features Tips & Tricks" question that remains active. Use Automator. 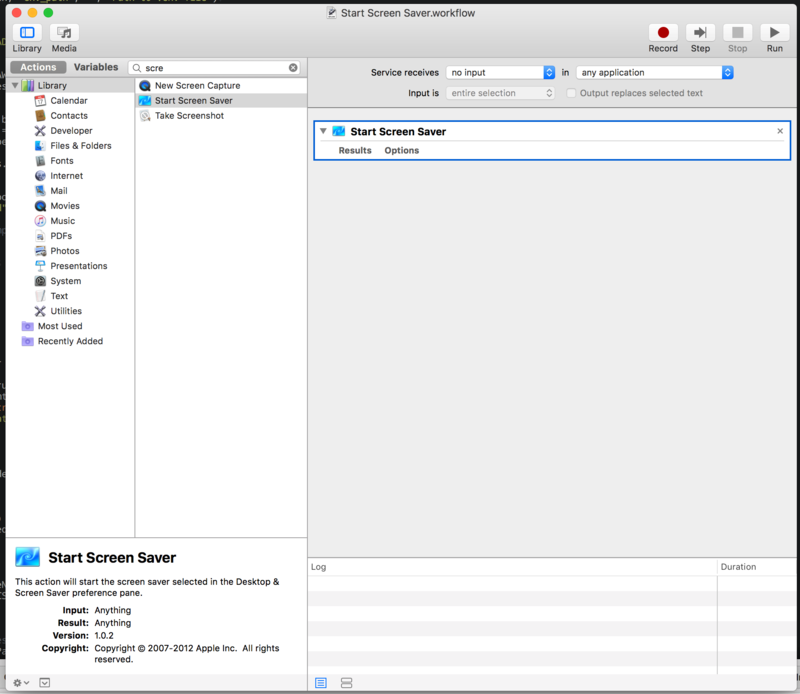 Simply open automator and drag in the "start screen saver" action, select "no input" under the "services received" menu, and hit file > save as "Start Screen Saver". This will now appear under System preferences > Keyboard > Shortcuts > Services > General, where you can assign it any hotkey you desire, just as you would any other system action. Now you can launch the screen saver with any keyboard shortcut (I use F19). I agree with Jason's answer - the only built in way to lock the screen (which sleeps the display but does not engage the screensaver animation) is the shiftcontrolmedia eject shortcut. A free solution would be to use RedSweater's product FastScripts to map your choice of keyboard shortcut to call one of the AppleScripts that are floating around the net to toggle the screen saver engine rather than just let the display sleep. I'd try making a simpler script just to open the engine at the hard coded path if you only wanted to engage the saver. Drag the app ScreenSaverEngine.app located in /System/Library/Frameworks/ScreenSaver.framework/Versions/A/Resources/ into your dock bar, click it and it takes you into screensaver. Here's a bit of a hack involving the Keychain Access utility that allows you to define a shortcut to lock the screen -- it's five years old and I haven't been able to verify if it still works, though. Someone else mentioned using BetterTouchTool to assign an shortcut to running a terminal command. I thought I would pitch in that as of my writing this answer, BTT has a native "Start Screen Saver" action which will do exactly what you are looking for. On some computers it is CTRL-SHIFT-POWERBUTTON. Not the answer you're looking for? Browse other questions tagged keyboard screensaver . How to run the screensaver through a hotkey? How to change system “Hide All” keyboard shortcut? How can I set a keyboard shortcut to paste text?